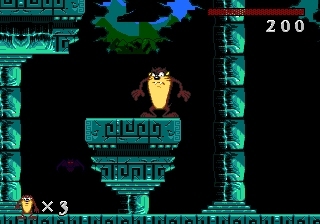 'Taz Mania' is yet another 16bit platformer. Is it fair that the game and the protagonist have been forgotten about today? Published by Sega / Warner Bros Inc.
6 year olds have no idea who the Tasmanian Devil is; this was the conclusion I came to following a massively limited poll. I asked my daughter and her friend to give names to the cartoon characters I showed them. While Mickey, Minnie, Donald and Goofy where familiar they had clearly never seen the Loony tunes characters before. Bugs Bunny was thought to be Judy Hopps from 'Zootopia', Daffy Duck was named Donald's brother and Taz caused one to cower because he was "too scary". This may all have been influenced by the fact we play 'Disney Infinity' so my informal polling had to go further. Neither my wife nor work colleagues mentioned Taz when asked to name cartoon characters they watched when they were younger. It may not have been scientific testing but the Looney Tunes characters and specifically The Tazmanian Devil seem to have been forgotten. I'm hardly that surprised. I loved animation as a child, still do today in fact, but Taz hardly showed up on my radar. He only appeared in five WBshorts and had a noticeably smaller presence in the Warner Brothers animated films that followed these. However, bizarrely, he was revived in the 1990s as the main character in 'Taz Mania' which ran for 4 series; a total of 60 episodes. Broadcast from 1991 to 1995, the show follows Taz's adventures in the fictional land of Tazmania (based on Tasmania) where "the sky is always yellow, rain or shine". The series actually looks surprisingly cheap and has a very post modern, self aware humour Similar to Tiny Toon Adventures. Sketches typically showed that a perpetually hungry Taz could actually speak perfectly normally when he wanted to. He is less ferocious and more thoughtful than his original incarnation and the hardship he faces in life are typically endured to prevent his family suffering. 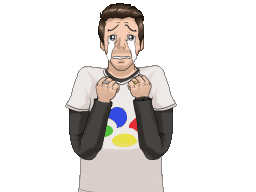 New Taz is the oldest child in a family that consists of two younger siblings, his parents Jean and Hugh and their pet. A large number of supporting characters also appear including Taz's loud, grouchy incompetent boss Bushwhacker Bob, Digeri Dingo, Wendal T. Wolf, Francis X Bushlad and Buddy Boar. Across the 103 individual stories that make up the episodes, the original Looney Tunes characters also cameo. The series was popular enough to warrant the creation of five games, including two on the Mega Drive. The first shares a name with the TV series on which it is based. 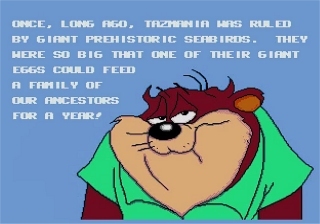 In 'Taz Mania' the game, Taz's father Hugh mentions that there's a giant seabird that lays eggs so large they could feed a family of Tazmanian devils for over a year. Taz becomes excited by the prospect of a potentially large omelette and leaves in search of one of these giant eggs. Sega Power Magazine noticed a bit of a flaw in this story. "Quite why they need it when Tasmanian Devils can seemingly eat anything remains a mystery". It's a very simple plot that makes about as much sense as the stories in the TV series. However it serves as enough motivation to keep a player platforming through this short one hour game. "The game isn't tough enough or long enough [...] It's for the gamer who wants a good laugh more than a great challenge" agreed reviewer Neil West at the time. "There's enough here to keep you interested until you finish it [...] but you'll probably finish it far too quickly." West wasn't alone in his opinion that the game doesn't last long enough to justify the original hefty £40 price tag. "Even on HARD there's no real challenge" noticed critic Julian Rignal. "Everyone who's played a few platform games of this type will finish the game much sooner than they'd like." Gallop records show that 'Taz Mania" was a bestseller in the UK for 2 months, but it certainly didn't deserve that many sales. It's an extremely limited game, inferior to others out at the same time. "Game play remains locked to the explore-judge-dodge formula and that eventually gets repetitive" claimed Sega Power magazine. "Zero out of ten for originality" Mean Machines magazine agreed. " Like so many other platform games Taz must navigate multi directional levels, killing random enemies and eating everything in sight for points. Our hero can also perform a spin which can kill anything that he comes into contact with. It's an attack that's also used to kill the level guardians that are randomly peppered through the game. However when in tornado form Taz is difficult to manipulate. "'Taz Mania' has poor controls" said Power Play magazine. "If Taz does not jump pixel-perfectly, he is guaranteed to miss the desired platform". Occasionally new play mechanics sneak into the game but rather than break the monotony they are so badly implemented that they actually end up making you frustrated. 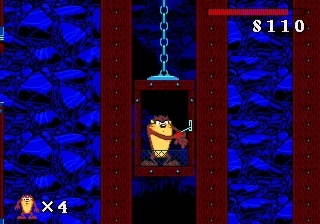 For example, an underground mine level half way through the game, sees Taz travelling through the stage by leaping between elevators. I got thoroughly lost in the stage and had to look online to find out that I needed to use the momentum of one descending elevator to sling shot Taz up to a higher section. There was no signposting in the game for this and as it took me over a dozen attempts to time the jump correctly I can't see how you would naturally discover that this is what you needed to do to progress. The logic in the game never seems that consistent. Some platforms can be jumped through and stood on; others are solid and can't be penetrated. As a result you spend far too long jumping against random blocks to see how they behave. While it's not game breaking it doesn't feel very elegant, especially compared to Nintendo's finest platform games; where you seem to instinctively know what to do and how to progress every time you see a new screen. Even the exit to each stage can be tricky to find simply because it seems to have been arbitrarily placed. While there is a literal sign post when you reach a stage's end you often stumble on it by accident as levels seem to fluctuate wildly in length. Some take literally seconds, others see you traipsing around for five minutes. "Some of the fifteen levels provide a real challenge, a lot of them are a little too short to fully test your gaming abilities" agreed Mean Machines magazine. However, maybe some bits just feel longer because you're battling with the controls, trying to make Taz respond in the way you wish. Speed runs online show the game can be finished in 20 minutes and that's playing every level without glitches or shortcuts. When paused 'Taz Mania' looks nice, with a big sprite and colourful backgrounds, but when playing the cracks show. "You should never judge a game by its screen shots" warns Neil West. 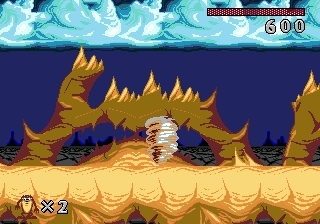 The main protagonist is terribly animated and it looks like half his run animation is missing as he skips through the stages. Many reviewers seemed to think 'Taz Mania' looked like the cartoon but presumably they meant that's because it has a recognisable protagonist who has some humorous idle animations. The garish colours and repetitive backgrounds of the game would have made watching the cartoon series unpleasant. The graphics are not the lowest point of this game though, the audio is awful. The music feels like the worst kind of interpretive jazz where the melodies are working against the backing beat creating an uncomfortable sense of discord. 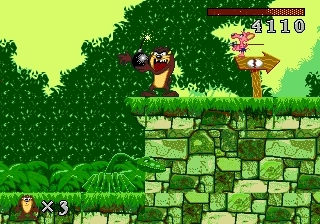 To make things worse Taz makes an annoying noise when he jumps (something you do a lot in a platform game). On top of that some platforms also make noise when they are stood on and such a barrage of sound will have you reaching for the TV’s mute button. There's no shortage of incredible 16bit platform games so the only people who would prioritise 'Taz Mania' over the many many better games would have to be a fan of the series. With a diminished interest in Looney Tunes characters and everyone apparently pushing Taz to the back of their mind it seems very few people will dig out this game to play. We have a habit of remembering what's good and forgetting what's bad. Unless we are consciously reminded Long Term Memory erodes till we are left with only the most cherished of memories. 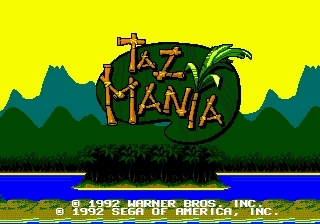 If the World has forgotten the Tazmanian Devil I only hope that it has also forgotten playing this 'Taz Mania' game. It's one memory we couldn't probably all do without. When you buy games in bulk you typically have to live with games you wouldn't have bought if they weren't included. 'Taz Mania' is one such game as is its sequel 'Taz in Escape from Mars' which is also a pretty poor game truth be told.